The stovetop smoker has been making a regular appearance on this blog, hasn't it? 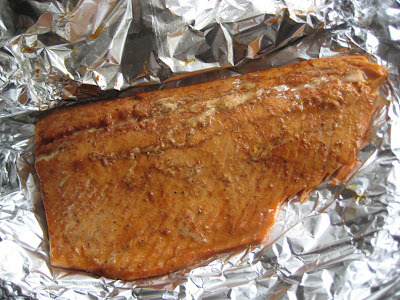 Its latest adventure has been to smoke a slab of skinless salmon. While the results were pretty decent - smoky at the very least - there's a lot I could have done to make it better. 2. I probably should have brined it in a mixture of salt, pepper, and brown sugar. And water, duh. I did rub on some sugar/pepper/salt before smoking, but the flavor didn't permeate the meat at all. 3. I probably should have cooked it for a shorter amount of time. I looked at various recipes that gave times from 15-40 minutes and settled on 30. The heat was very low, and the meat was on a rack within the smoker, but it was still a bit overcooked and dry. I have a hard time getting salmon to cook properly, so it may well have been me. Still - it was really very easy. Brining it can't make it that much more difficult, can it? Has anyone else tried smoking fish on the stovetop? Would love to hear from you.